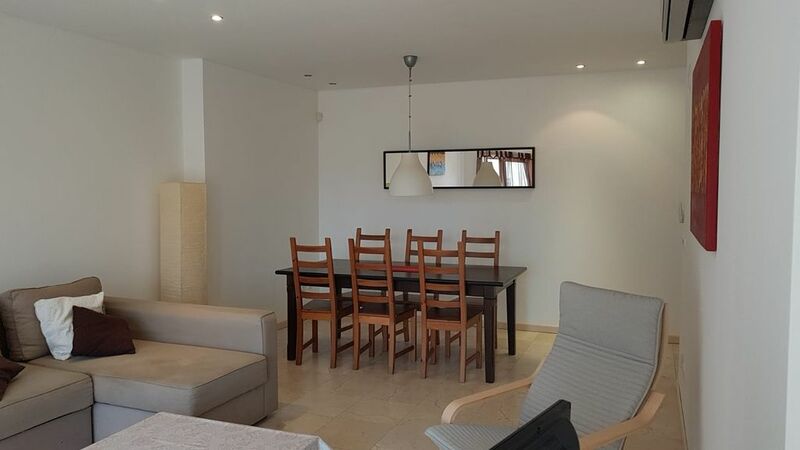 Beautiful 2 bedroom apartment with terrace (35ft long). Air-conditioning throughout, surround sound, central vacuum system and electric shutters. TV and DVD player in living room, Android box. Wi-Fi. Patio doors onto the terrace from living room, kitchen and twin bedroom. The apartment has a fully equipped kitchen and single bay underground garage with lift to all floors. There is a secure garden with pool and play area. Sao Martinho is a great location to spend your holidays. The people are very friendly and there is a relaxed air about the place. It has a sheltered beach which is an excellent and safe swimming environment for children. There are a good mixture of restaurants and bars along the seafront which cater for all tastes. It is a good base from which to explore the surrounding areas. Luxury marble bathroom with hydro-massage shower over bath. Basin, wc and bidet. Large and spacious lounge/dining room with L shaped sofa bed (sleeps 2), TV and DVD player, Android box and dining table and 6 chairs. Fully equipped kitchen - Gas hob, electric oven, microwave, dishwasher, washing machine, kettle, toaster, fridge-freezer, iron, ironing board, clothes horse and table and 4 chairs. Android box attached to TV. TV only picks up local stations. Praia D'El Rey Beach and Golf resort is approx. 20 km away. Rio Maior is approx 50km away. Notes on accommodation: The apartment is finished to an excellent standard. Unfortunately no smoking or pets are allowed. Outside: There is a shared heated pool with sun decks and sun loungers which is open all year round. There is a communal room located beside the pool with changing facilities and an area to relax. There is a small children’s play area. The pool and play area are enclosed. There are parking bays outside the building. Cleaning / Towels / Linen / Maid service: Bed linen and towels are included (not beach towels). The property is cleaned before and after your use. There is no cleaning service during your stay for rentals of one week but this can be arranged at an extra charge. Please ask. Other: Entry to main building via coded door (pin required). Secure underground garage. Everything you need for your stay. Glad you had a nice stay. Thanks for the feedback I will talk to our property manager about the water. We had an Outstanding stay. Walking distance to the Shore. Near the markets for groceries. Secure building. Secure parking. It was as advertised. We would return, have a great time. Thanks Curtis. It was a pleasure to have you. We have just returned from a wonderful week in Sao Martinho. This was our first visit to Portugal and we found there was lots today in this region, especially if you like culture and history which we do. We loved Obidos best of all, a mediaeval and charming town. We also visited Alcobaca monastery, the Convento de Cristo at Tomar and the fantastic caves at Mira de Aire with a water-park next-door - highly recommended! The apartment is about 10 minutes walk from the sea front and is spacious and well equipped with a lovely long terrace , in a well maintained complex with heated outdoor pool that we had to ourselves a lot of the time. Most of the holiday was pretty well perfect apart from the beds which we found to be rather low (Japanese style?) and somewhat uncomfortable. Also the air-con in the twin room didn't seem to work, however the temperature was a comfortable heat of around 25 degrees all week so it didn't matter too much. We will recommend Sao Marthinho to our friends - we loved it here as it is not commercialised and is quite typically Portuguese. All in all, a great stay. Thank you for your review. We will take on board everything you said and rectify them going forward. Thanks for your review. We will take on board your remarks. Hope we see you again. Well, the apartment was really nice and we enjoy the 10 days holidays. Air conditioning went before you arrived. Our property manager wasn't able to get it fixed in time for your stay so she provided heaters. The key for the garage needs to be re-programmed and we have the condominium manager looking after this. Because people like their showers at different temperatures it does take some fiddling with to get it right. I will get the toilet fan fixed. Pool is closed from September to May so should have been covered. I will point this out to the condominium manager. I'm glad these things didn't affect your stay and I will see to them immediately. The beach at San Martinho is a 5 minute walk from the apartment. The water is very calm due to the waves breaking further out as they enter the ‘Horseshoe’ shaped bay. This makes it ideal for children to play in. In the summer shade tents are available on the beach. There is also a lifeguard on the beach. A children’s playground is located at the end of the promenade and there are numerous cafes and restaurants dotted along the length of the promenade. Lisbon airport is between 1 and 1.5 hours drive. Porto airport is between 2.5 - 3 hours drive. Foz do Arelho - 15 minute drive – beach, swimming, sailing, surfing. Nazare - 15 minute drive - old fishing town, cable car, beach, swimming. Caldas da Rainha - 15 minute drive - Spa town, two large supermarkets. Obidos - 20 minute drive - medieval walled town. Alcobaca - 25 minute drive- large monastery town. Peniche - 40 minute drive – surfing, nature reserve. Sintra - 1 hour drive - Pena National Palace, Sintra-Cascais Natural Park. Sao Martinho is served by a railway station and bus services to Lisbon. The market is two minutes walk around the corner. The bakers, butchers, deli, newsagent, internet cafe, and florist are beside the market. The supermarket is a few minutes walk from here. There are banks, cafes, restaurants, take-aways, shops and a tourist office all close by. Riding, surfing, body boarding, walking, paragliding, canoeing and caving are all close by. Changeover Day: Flexible changeover day depending on availability. Arrival and departure times at your request where possible.